Lent is the season in the Christian calendar when the focus turns to simple living, prayer, self-examination, and fasting in preparation for Easter. People often talk of ‘giving something up for Lent’ which is a part of its rich tradition of self-sacrifice and doing without. While there are many aspects of Christian discipleship that do involve a turning away or self-denial, our discipleship may also require a ‘turning to’ or a ‘taking up’. That perspective may make our discipleship more sustainable. This year we have chosen to combine these ideas. 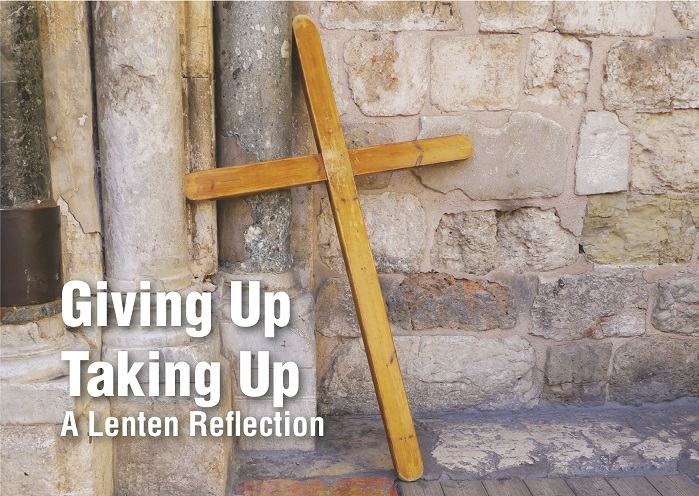 As such, our Lenten reflection is themed Giving Up, Taking Up. The booklet gives suggestions about areas for giving up and taking up in different aspects of our Christian walk. Lent is a good time to consider these areas, although our discipleship continues all year. It is our hope that this booklet will help you to reflect on the death and resurrection of Jesus in your own giving up and taking up. We have also produced a Mandarin Chinese version of the Lenten booklet this year. You can also download a free version of the booklet. Download the Mandarin Chinese version here.